Rock Tumbler Belts: How Long Should They Last? 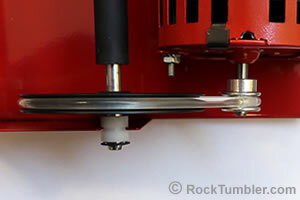 Home » Parts » How Long Should a Rock Tumbler Belt Last? How Long Should a Rock Tumbler Belt Last? 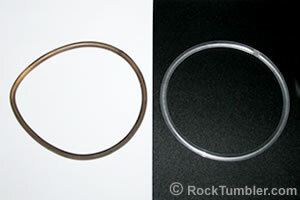 Rock tumbler belts come in a wide variety of sizes, shapes and styles. Be sure to use one that is designed for your tumbler. The proper belt and good tumbling practice can make your belt last a long time. Your rock tumbler should not be a belt eater. If you have a quality rock tumbler such as a Thumler's Tumbler or a Lortone Tumbler, your belts should last through many batches of rocks. If you take good care of them the average belt should last for a year or more. We use our tumblers regularly and most of them have belts that are one, two, three or more years old. If your belts last less than a few batches of rock or less than a year, please read the advice below. 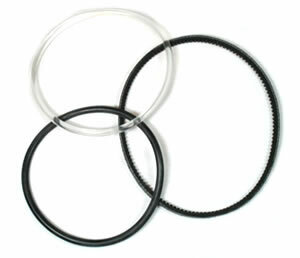 We believe that it will help you increase the useful life of your tumbler belts. You are probably doing some of the things that we recommend already. The belt should not be extremely tight. You can test the tension by pressing on the top of the belt with your finger. The belt should have a little "give" when you press lightly. (See photo at right.) Adjust the belt so that it is tight enough to turn the drive shaft pulley without slipping under the load of a tumbler barrel. While you are looking at the tension on the belt look at the pulleys. There should be one pulley on the end of the motor shaft and another on the tumbler's drive shaft. These pulleys should be in perfect alignment when the belt is on and the motor is running. (See photo at right.) If they are not in perfect alignment the belt will be subject to stress and abrasion. (A sign of abrasion is a belt wearing on one side or tiny particles of belt on or under one of the pulleys.) If your pulleys do not line up perfectly you can loosen the set screw on one of them and slide it in the proper direction for alignment. Finally, a rough spot on one of the pulleys could be damaging the belt. Run your finger or a piece of cloth over all parts of the pulleys that the belt contacts. If there is a sharp edge you might feel it with your finger or the cloth might snag. Smooth any sharp spots with a piece of sandpaper. Pictured above is a belt that has sat stationary on a tumbler for years (left) and a brand new belt (right). Some belts break because they are old or low quality. Others fail because they are the incorrect belt for your tumbler. Old belts can be stiff or cracked and break with a small amount of use. Low quality belts can stretch, break or wear quickly. We recommend buying a fresh belt from a busy rock tumbler dealer who sells a lot of them. Substitute belts designed for vacuum cleaners or other appliances rarely fit precisely or last very long. We receive new belts directly from the manufacturer or distributor every few months and rotate our stock. This photo is looking down on the machine, viewing the motor pulley and the drive shaft pulley. Notice how they are in perfect alignment. Operation problems are duties that the person who runs the tumbler should perform. The most important is keeping the tumbler clean. If grit or dirt builds up on the pulleys they will contribute to belt wear. Oil, lubricants, strong detergent and cleaning solutions can dissolve or weaken a belt. The belt should be cleaned with a dry cloth or paper towel. If it is oily it can be cleaned with a very mild dishwashing soap without additives such as Dawn. Overloading the tumbler barrel can cause a belt to slip, break or wear. Overloading can happen when you fill the barrel too full. It can also happen if you are tumbling a material such as hematite that has a high specific gravity. When tumbling heavy materials reduce the amount of rock in the barrel to stay within machine capacity. Finally, extreme temperatures can cause belt problems. If your tumbler is in an unheated building in winter, freezing temperatures can make the belt stiff and brittle. This can lead to wear. Another problem would be freezing of the water in the tumbler barrel. This can damage the barrel, pop the lid or cause the barrel to deform and jam the machine. Nobody enjoys checking their tumbler to find the motor running and a stationary barrel. Following the precautions above should make that a very rare experience for you.